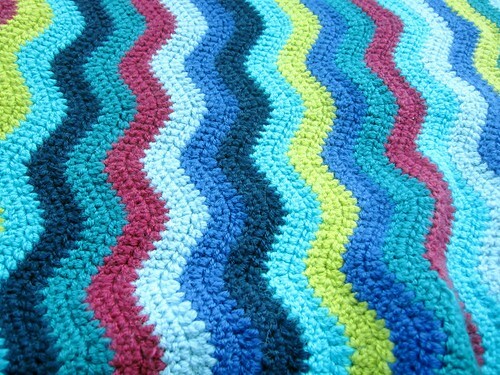 I finished H's Ripple Blanket while at Wonderwool last weekend. I love it. Yarn: baby melter acrylic FTW! Aka: Jarol Heritage DK, which is actually 55% wool/25% acrylic/20% nylon, and very nice to use. 270 yds/100g skeins, less the one each of navy, pale blue, teal, turquoise, red, chartreusey-green and royal blue. 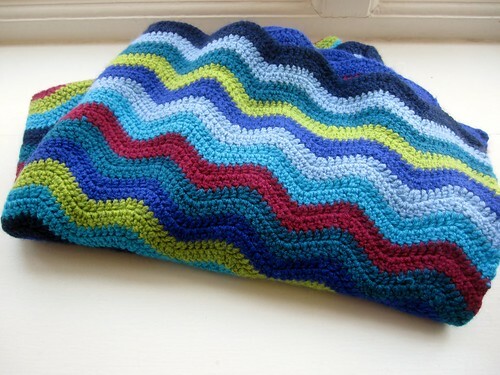 Comments/mods: since this is a recipe and not a flat out pattern, I had to do a bit of (ehem) swatching to get the size I wanted. I did a little practice swatch (also usefull for practicing decreases, which I hadn't done before) and figured out how many stitches I needed for approximately 24 inches wide (answer: 90). Then it was non-stop ripple action for a couple of weeks. 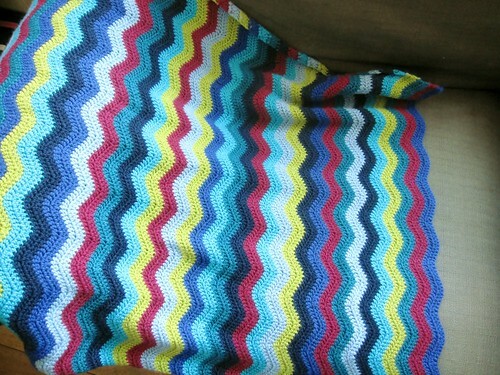 I ended up doing seven stripes of each color, which took approximately three quarters of the 100 gr ball. Total yardage used for this, therefore, was approximately 1400 yds. Finished measurements after a trip through the washer and dryer: 30 inches wide by 32 inches long. Due to the wool content, it did felt slightly in the dryer, but it came out nice and thick and cushy. Done just in time to go off to baby H this weekend. Now I need to figure out what to do with all the leftovers (color block baby sweater anyone?). 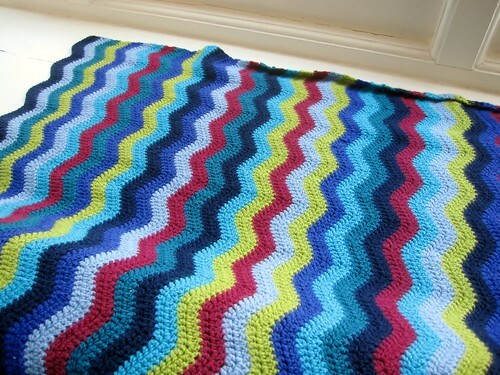 Written by porpoise On May 1, 2013 In "FO", "blanket", "crochet"